SureGear high precision p - SureGear high precision planetary gearbox, inline, two stage, 70 mm frame, 15:1 ratio, nominal output torque 18 N-m (159 lb-in). For use with SureServo SVL-201(B) motors. SureGear high precision p - SureGear high precision planetary gearbox, inline, two stage, 70 mm frame, 25:1 ratio, nominal output torque 27 N-m (239 lb-in). For use with SureServo SVL-201(B) motors. The Direct Automation SureServo family of brushless servo systems is fully digital and offers a rich set of features to cover a broad range of applications. There are eight standard servo motors that can be operated in combination with one of three standard servo drives. The servo drives can be configured for a range of command sources including analog torque, analog velocity, "step & direction" or "up & down" pulse position, quadrature encoder follower, and built-in motion controller with preset position, velocity, or torque. Presets can be selected with switch inputs or modified with the MODBUS serial interface. 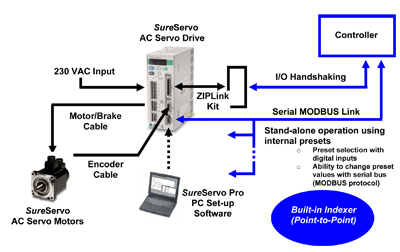 Configuration and diagnostics of the servo drives can be accomplished with the integrated keypad/display or the easy-to-use PC-based software called SureServo Pro. The SureServo brushless servo motor line includes a 2500 line incremental encoder with quadrature data signals (A+, A-, B+, B-) and a marker pulse (Z+, Z-). All three signals have a line driver output resulting in 10,000 pulses per revolution plus index mark as the standard resolution inside the servo drive. Each servo motor also has one connector for the encoder and another connector for the motor power and optional 24 VDC spring-set holding brake. 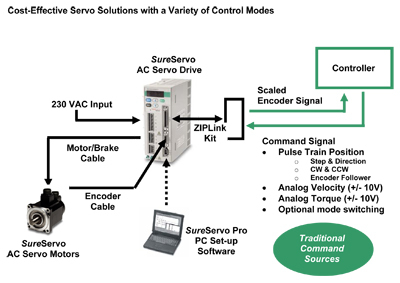 The SureServo family includes standard accessories such as motor encoder cables, motor power/brake cables, ZIPLink kit for drive's CN1 connector that provides for easy connection of external controller and I/O, optional external regeneration resistors, and optional AC input filters. Don't forget the cables and ZIPLink Break-Out Board Kit! Select the "Technical Info" tab above to review the four page ordering guide for the eight standard SureServo systems. Each of the eight standard servo systems has a torque-speed curve including the motor inertia for reference. This is the fundamental information that you need to select the servo drive and matching motor for your application. SureServo systems are easily controlled via 'step & direction' or 'step-up/step-down' commands from any PLC with a high-speed output. Electronic gearing can be used to scale the incoming pulse frequency from the PLC. This allows the pulses from the PLC to command the exact amount of movement required for a specific application. The SureServo drive's on-board indexer will allow the programming of up to eight unique motion profiles. Discrete inputs can be used to initiate any of these profiles. The built-in MODBUS interface will offer the flexibility of downloading customized motion profiles to the drive as they are needed. These profiles can be selected and executed based on additional MODBUS commands or via discrete inputs. Eight programmable inputs and five programmable outputs assure real-time connectivity with any control system. Velocity and torque can be controlled with a ±10V analog input signal or with the onboard indexer. Two analog outputs are available and configurable for monitoring purposes. Three tuning modes include: manual, adaptive easy-tune, and adaptive auto-tune. The adaptive modes allow the drive to adapt to dynamic load conditions during operation with little or no initial set-up required. The SureServo drive parameters can be changed from the drive's built-in keypad or the PC set-up software. SureServo drives will communicate via a MODBUS interface across RS-232, 422, or 485 serial links. The SureServo drives can be pre-programmed with parameters for up to 8 separate motion profiles, which can then be initiated via discrete inputs from a PLC or signals from other devices, even pushbuttons. These moves can consist of precise, user defined accelerations (ramps) and preset speeds. Parameters for vibration suppression (notch filters), load inertia range, proportional and integral gain, and many others can also be customized for specific applications in the SureServo drive. All SureServo systems offer two adaptive auto-tuning modes which continue to tune the system while it operates. The SureServo products also have a built-in MODBUS interface. MODBUS enabled controllers, including PLCs, can initiate moves and download parameters to the SureServo drive across the MODBUS link. The MODBUS link can also supply information back to the controller about the performance and status of the servo motor and drive system. Multiple SureServo systems can be controlled via a single MODBUS port on the PLC. The SureServo's ability to download custom motion profiles from a PLC on the fly, and execute these moves on command, allows the ultimate in flexibility and control with a PLC based motion controller. When using the SureServo traditional command interface all programming is performed in the PLC. All of the PLCs available from AutomationDirectoffer some form of high-speed pulse output. Even the DL05, AutomationDirect's $195 PLC, includes a single 7kHz high-speed output which can be used for limited motion control applications. As a general rule, it is beneficial to keep the reflected load inertia as low as possible while using the full range of servo speed. SureServo™ systems can go up to 5,000/ 4,500 RPM for the low inertia motors and up to 3,000 RPM for the medium inertia motors. However, when investigating the effect of different speed reduction ratios DO NOT forget to include the added inertia of couplings, gearbox, or timing belt pulleys. These added inertias can be significant and can totally undo any inertia reduction due to the speed reduction. If the application requires low speed and high torque then it is common to introduce a speed reducer so that the servo system can operate over more of the available speed range. This could also have the added benefit of reducing the servo motor torque requirement which could allow you to use a smaller and lower cost servo system. Additional benefits are also possible reduction in reflected inertia, increased number of motor encoder counts at the load, and increased ability to reject load disturbances due to mechanical advantage of the speed reducer. Reducers can possibly allow the use of a smaller motor or allow the motor to be repositioned. For example, some reducers would allow for in-line, right angle, or parallel mounting of the motor.